Below a certain size (4 cm) the mussels must be left on their rocks, and the clams returned to their home in the sand. 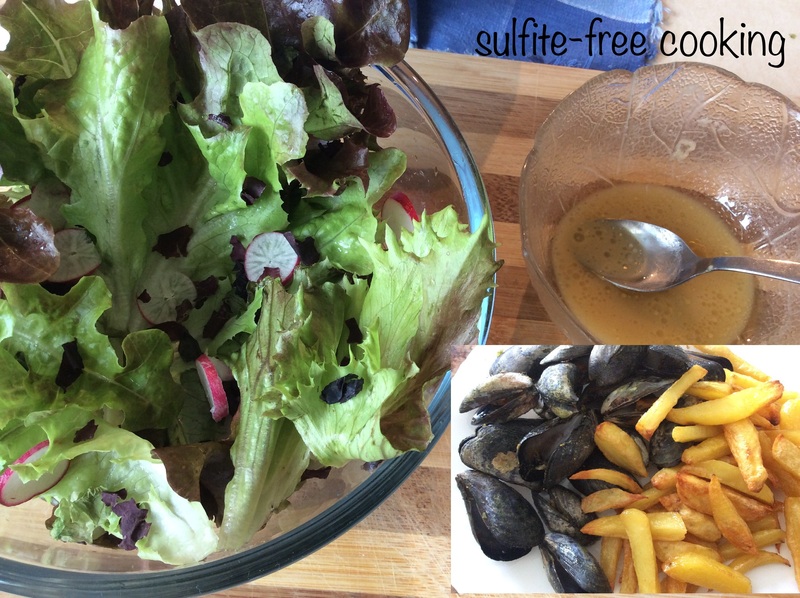 A typical seaside menu when vacationing in France being « salade moules frites », in other words mussels and fries with a side dish of lettuce, I set forth to create my own. The fresh mussels I just cooked in a pot over high heat, letting them open. Thank God they don’t scream. No need for salt, but sometimes I add a touch of curry. My fries (or rather « chips » for my dear neighbours) are not fried ! I stopped frying potatoes long ago, both for health reasons and because I can’t stand the smell of fried food in my home. I drizzle the potato chips in olive oil, spread them on a lined baking sheet and bake them at 210°C / 410°F (or 190°C / 375°F fan-forced). You need to make sure they don’t overlap so they will all get crispy. After about 45 to 50 minutes, you stir them so they get brown on all sides ; baking doesn’t take much longer from that point on, so keep an eye on them. Again, we only add salt on our plates if we deem it necessary. As for the salad, while the potatoes were in the oven, I added some radish slices to my lettuce and made a Japanese style dressing, using white miso paste (milder and sweeter than dark miso), rice vinegar and roasted sesame oil, which we love. I also sprinkled the salad with some « paillettes d’algues », or roasted seaweed flakes. If you have never had dried or roasted seaweed, it tastes « sea-salty », and if you have more than the size of a flake in your mouth, you might be turned off because you will want to chew on it, and when it gets wet you will really get a slimy taste of the sea ! If you can only buy the dried chips kind, I advise you to crumble them into flakes before sprinkling them onto your salad. Who declared war on us ! Of course this is all water under the bridge! The song actually refers to a battle at sea won by the French corsaire Surcouf in 1800. Note that no song was ever written in France after the battle of Trafalgar!!! Have a great day, dear neighbors!